Is this the future of vegetables ? Nick Carver certainly thinks so having unearthed this whopper in his vegetable garden . 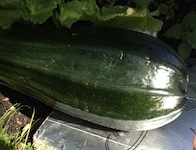 The monster marrow is already over half a meter in length and three quarters of a meter in circumference with approximately three weeks still to grow . Nick has been encouraged to enter his exhibit into a big vegetable competition on 19th September.